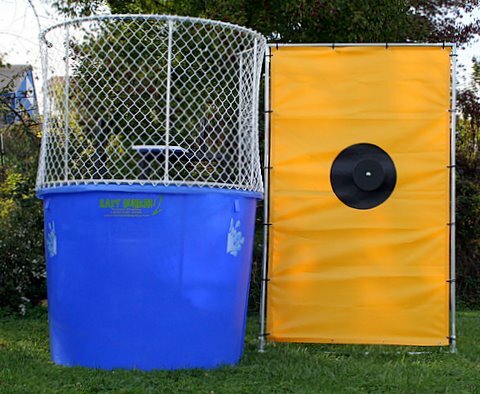 Rent a dunk tank for your next backyard party or special event. It is gauranteed to be the hit at any event! Dunk tanks have been delighting crowds for years. The concept of dunking the boss at the company picnic, or dunking the local "celebrity" at fundraiser events has become an American pastime. The dunk tank has always been a leading money maker at fairs, carnivals, and block parties as well as a great rental item for your backyard party. Dunk tanks have been the latest craze for summertime picnics. Everyone at your party will be entertained for hours. Imagine how refreshing and fun it would be for you and your guests to be dunked on a hot summer day. Now, you can have one of these entertaining and refreshing dunk tanks delivered to your event by our Jolly jumper crew. ONLY $200 PER DAY, DELIVERED!